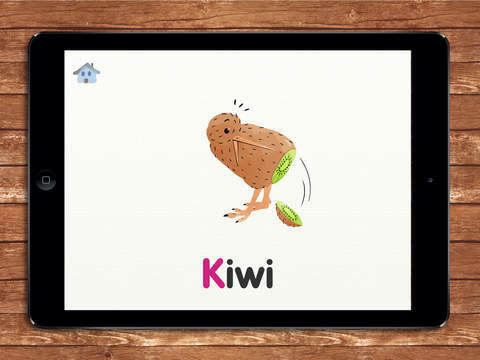 There are many apps that teach about the letters and their sounds but few that approach the quality and usefulness of this one. It isn’t so concerned about learning the alphabetic order itself, although exposure to it is high enough that it is likely to help with this, rather it is aimed at developing letter recognition, visually, by name and by sound. There are many ways to interact with the letters of the alphabet. To learn, children can trigger the pronunciation of each letter. They can hear its spoken sound and see its written form in upper-case, lower-case, and cursive. To test and develop their own understanding, there is a number of activities, such as matching letters to words, letters to sounds, and lower-case to upper-case letters. Each is made with obvious care and artistic elegance. The quality of this app’s presentation cannot be faulted. Colourful and clear graphics are drawn in a very child-friendly style but are more original than those found in similar apps. Everything is clear and its purpose easily discoverable. Each letter, sound and word is spoken clearly. Jolly and fun music completes the experience. A sensible set of options can fine tune the app to provide the experience that you want for your child. How activities use different letter cases, whether certain sound effects are used and a fine tuning of what letters to test children on can be controlled. This isn’t behind the parental gate, which seems the natural home for it, and is the only location in the app that may result in confusion for children. There’s nothing catastrophic that can be done from this screen, but curious children could well want adults to put it right for them. The app covers the alphabet in English, French, German and Spanish. This isn’t just limited to the equivalent English alphabet but, in Spanish, covers the extra letter specific to it. The spoken words appear to be by native speakers and are all easily understandable. This opens up the uses of the app. Children raised in multi-lingual families, early second language teaching and just natural curiosity are all addressed by this included international feature. The app is perfectly designed for independent learning but will also be wonderful when used by parent and child. The built-in activities can be discussed and worked on together and parents can add extra prompts and questions. The app includes a useful flashcard section which is particularly suitable for this type of flexible learning. Alphamonster is both excellent and a complete experience as it stands, but it has another highly original plan for the future. Soon, a compatible set of physical letters will be released that can be combined with the app to merge virtual and real learning for children. This app really is as good as you could expect one of its type to be. Children will love to learn using it and adults will feel very satisfied with their choice of purchase. 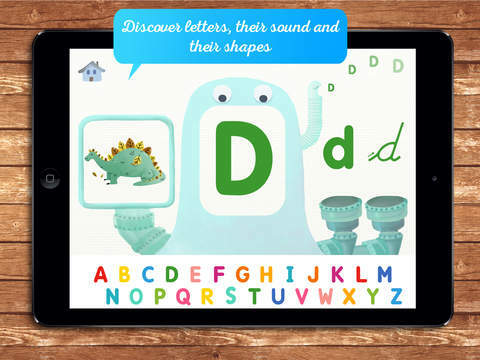 Learn all about letters: their names, their sounds and all their forms, with the help of the fantastic monstromachine! Have you seen the alphabet? The Monstromachine is eating it up! 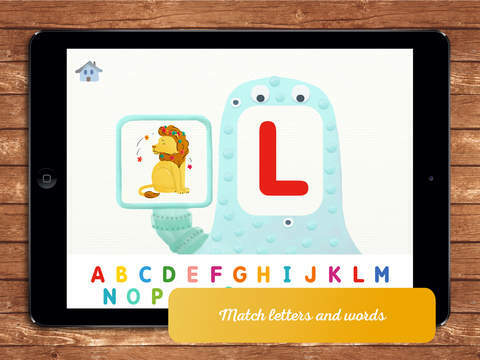 With this app, children will discover the alphabet and how each letter works, with recognition and association games to learn how to master these prerequisites to learning how to read. It is available in 4 languages! This app has no advertising or in-app purchases. Useful information can be found in a Parents’ Corner. 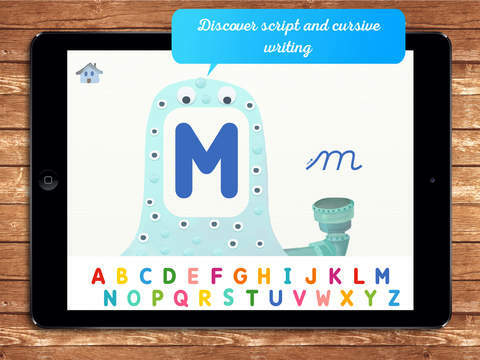 Alphamonster is a Marbotic app, a publisher that designs and creates innovative educational solutions blending sensory material and digital interfaces. 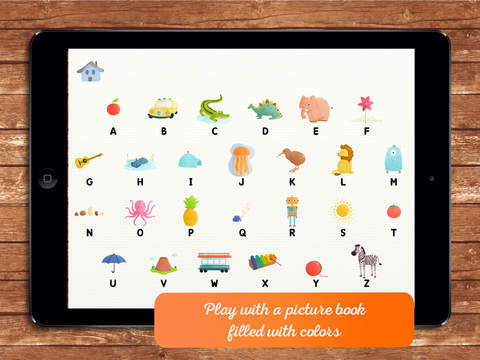 A wooden toy that interacts with tablets can be used to play with the app and stimulate the child’s senses even further!